Stoelman Papierrecycling’s policy is not focused on trading massive quantities of waste paper and cardboard. On the contrary, our main target is to deliver quality. Thanks to our experience, built up in over a century, we have obtained a remarkable know-how which enables us to deliver high quality grades of waste paper and cardboard to our clients. There are many varieties of waste paper and cardboard, they differ in quality and therefore cannot be used for the same purpose. For example, old newspapers are of a very different quality than that of photocopying or office waste paper and are therefore not used for making the same product. For this reason it is very important that waste paper and cardboard are sorted properly. In this way, for example, high quality woodfree paper packaging can be reused for making new high quality products. This would not be the case if it were mixed together with corrugated paper packaging or other recycled material. Recognizing these different varieties and qualities and hence separating and sorting them is what keeps us busy at Stoelman Papierrecycling. In the paper recycling industry, there is a difference between two types of paper and cardboard, namely Pre Consumer and Post Consumer waste. Pre Consumer Waste of Post Industrial Waste (also known as PIW) is paper and cardboard waste that derives from companies. Think of the large volumes of printed and unprinted waste paper that printers and box makers have to dispose of. The good, clean quality and availability of large amounts of this PIW makes it excellent for reuse. 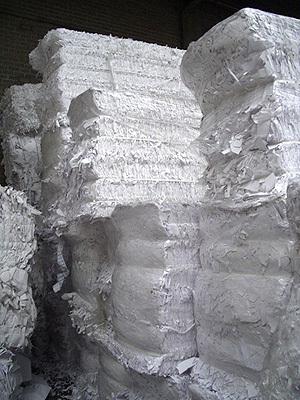 Stoelman Paperrecycling is a major processor of PIW. Post Consumer Waste, or PCW, comes from consumers and offices. Compared to PIW, this kind of waste is often very mixed and not so clean. Household paper and cardboard, such as newspapers and magazines are often collected together with boxes and cardboard and office paper can be contaminated. This is why it is always necessary to sort out PCW. This is done partly manually and partly mechanically. After having been sorted out the material is mechanically compressed and baled into large bales. This is one of the activities in which Stoelman Paperrecycling specializes. or call +31(0)23-5319357, we are at your disposal for any advice you may need.